Most pregnant women experience some sort of back pain with pregnancy. The good news is it’s natural and means your baby is growing, the even better news is you can seek back pain relief during pregnancy. Most women don’t experience back pain during early pregnancy; it slowly enhances overtime. For most women, the back pain is noticeable where your pelvis meets your spine, at the sacroiliac joint. The sacroiliac joint connects the sacrum (triangular bone at the bottom of the spine) with the pelvis (iliac bone that is part of the hip joint) on each side of the lower spine. This primarily affects your lower back; upper back pain during pregnancy is uncommon. Weight gain. Women gain between 25 and 35 pounds during pregnancy. This can cause stress on your spine, which triggers lower back pain. Posture changes. Because of weight gain, your center of gravity begins to shift. Without even noticing, you may adjust your posture and the way you naturally move. Stress. Having a baby is an exciting but stressful time. Stress can cause muscle tension in your back, which may cause back spasms or back pain. Muscle separation. As the uterus expands, your muscles, which run from the rib cage to the pubic bone, may separate along the center of the seam. This separation may worsen back pain. Hormones. In preparation for the birth process, your body makes a hormone called relaxin that allows ligaments in the pelvic area to relax and the joints become looser. This also causes the ligaments that support the spine to loosen, leading to instability and pain. This is commonly referred to as sciatica. Exercise. Regular exercise strengthens muscles and increases flexibility. This helps ease stress on your spine. Heat and ice. Use a heating pad, cold pack or alternate between the two. Improve posture. Use proper posture when sitting at work or sleeping. When sitting at a desk, sit up straight with your shoulders back, rest your feet on a stool if needed. Also sleeping on your side with a pillow between your knees will reduce stress on your back. Never sleep on your back and don’t wear high-heeled shoes. 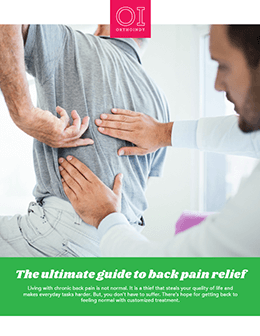 Manual manipulation: In some cases, a chiropractor can decrease back pain by reducing pressure on sensitive structures, increasing flexibility, improving blood flow and reducing muscle tension. Talk to someone. If your pregnancy is triggering stress and causing back pain, seek professional help or talk to a trusted friend. Pain medication. Always consult a physician before taking pain medication during pregnancy. Typically, Tylenol is safe for most pregnant women to take. Aspirin and other nonsteroidal anti-inflammatory drugs (NSAIDs) such as ibuprofen are not advised. In some cases, your doctor may recommend other pain medicines or muscle relaxants that are safe during pregnancy. Back pain during pregnancy is normal and it’s usually not a reason to call a physician. However, if your back pain becomes unbearable you may want to consult a physician to see what else you can try. Consult your OBGYN to see if they recommend making an appointment with an OrthoIndy non-operative pain management physician or learn more about neck and back pain treatment at OrthoIndy.